Yet again, the free and open internet is facing extinction. Besides calling your representatives to stop this attack on our equal internet, you can help spread the word using your own website(s) and one line of code. 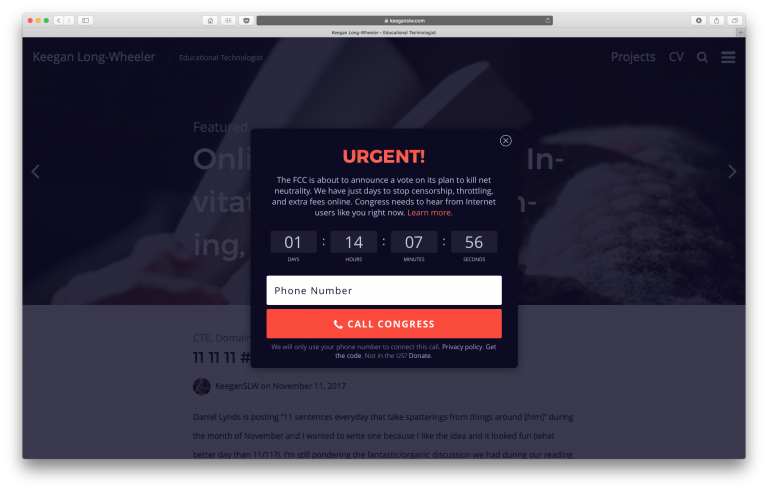 This 3-step guide can help you setup a widget overlay on a WordPress site to drive traffic and calls to congress and help keep our freedom of speech alive. 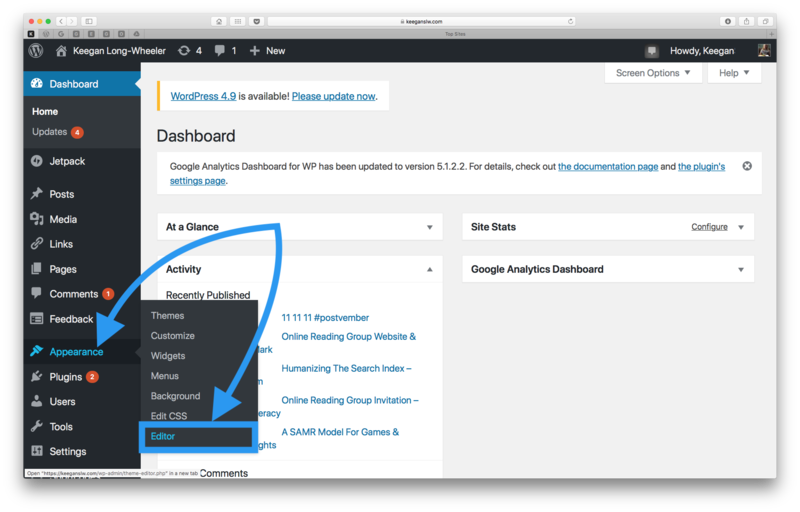 Login to your WordPress site and navigate to your Theme Editor (Appearance>Editor from the dashboard menu). 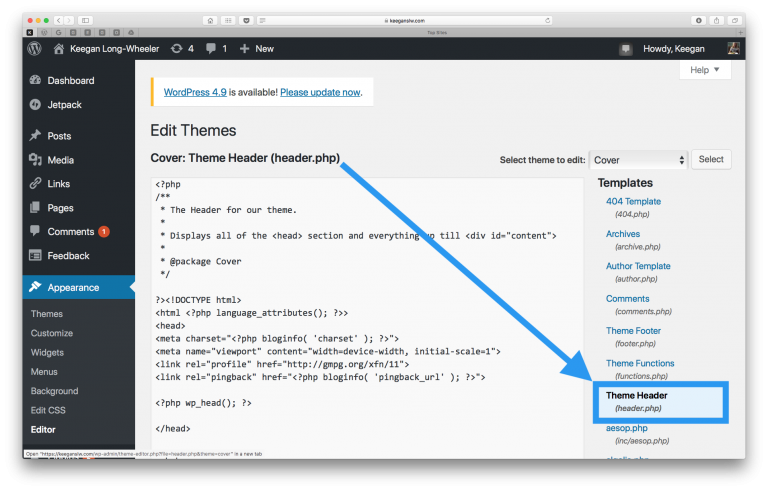 Access the Theme Header file (header.php) from the Templates sidebar. Copy and paste the following code (from https://www.battleforthenet.com) at the very bottom of the Theme Header file and click “Update File” to save. When someone visits your site, they will now be prompted with the following overlay. I’m using WordPress 4.9 and the Cover theme by Paul Eiche for my website. Your mileage my vary with this widget when it comes to process and outcome depending on the version of WordPress and theme you’re using. Although, I expect it to work just fine on nearly all sites. 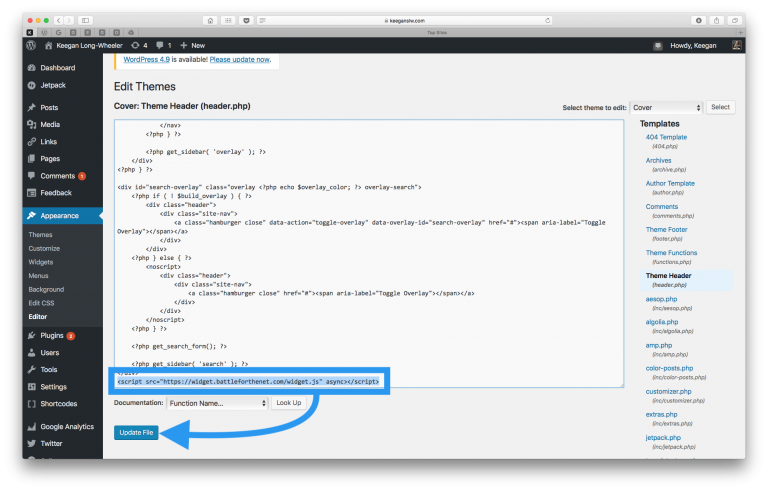 If you run into any issues with your website, you can return to the Theme Editor from your dashboard (your-site.com/admin) and remove the code you added. Feel free to copy the text of the original header.php file as a backup, but overall this edit is relatively quick and painless. Alternatively, you can add code or make any corrections from the raw header.php file on your web server. Also, this is a temporary widget by nature and you’ll eventually want to remove if from your website. Follow the steps again, but delete out the line of code you added to return your website to normal. Thank you for taking the time to help save the internet and our freedoms. The featured image is provided CC0 by Jenna Day via Unsplash. Your plugin is excellent Tom! I’m glad you’ve made adding the Net Neutrality widget even easier for folks who may or may not be comfortable editing php files. But also, for myself, this is an awesome learning opportunity that let’s me break down how php code could be used to accomplish the same task.